In a large bowl, beat eggs with a fork, wire wisk or egg beater. Gradually add 1/2 cup of milk. Add remaining milk, flour, salt and sugar. Beat until smooth. Melt butter in a 13x9-inch glass pan by placing it in the oven until the butter melts and pour mixture into it. Mix well with the butter. Bake at 450°F for 30 minutes or until top becomes brown. Serve plain, with syrup, or covered with berries. The first time I made this, the butter settled on top, so mixing it thoroughly is important. I am Finnish and have been eating Pannukakku all of my life. This is a great recipe however, the butter should not be mixed in with the batter. The butter is supposed to sit on top of the pancake, that is how the top gets crispy. It's not the most healthiest way of eating but boy it is yummy!! I'm with Nyman. I too am Finn & have eaten this stuff forever, & when my mom gave me her recipe she was very adamnant NOT to mix the butter in! For those that don't know what Pannukakkua is, it is not really a pancake as the name suggests. 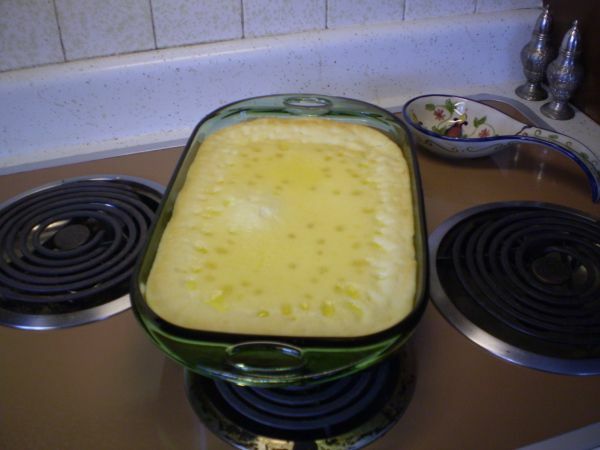 It is basically a large pan of custard, instead of using the individual custard cups. I don't agree with the reviews that the butter should settle on top because it becomes clarified and tasteless, unless there's something I'm missing here. I am also a "Soumalainen", Finn and don't like the grease that would be left on top if not mixed well.